The What: FBT debuted its Ventis range of loudspeaker at this year’s Pro Light + Sound show. Available in either passive or biamplified versions, each model has been designed for high performance and aesthetic appeal. The What Else: Based on a combination of B&C compression drivers and FBT’s own long excursion woofers, the 115, 112, and 110 models are two-way, bass reflex designs housed in 15-millimeter birch plywood. A full-grille design backed by acoustic cloth delivers the FBT’s characteristic sound, while fully rotatable constant directivity horns ensure accurate coverage. The three enclosures are suitable for both fixed installations and use on the stage. M10 points are included as standard while an optional U-bracket can be used for wall-mounting. For use on the road, the Ventis models include aluminum handles with rubber inserts, a 35-millimeter polemount socket, and a 45-degree sloped profile for unobtrusive placement onstage as a monitor. 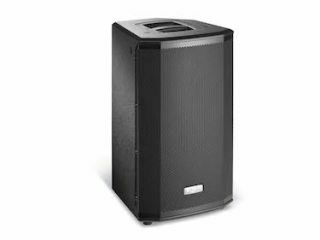 The multi-purpose Ventis 206 can be deployed as a front fill, an under-balcony fill, as a main providing pristine speech intelligibility, or simply as the full-range companion of a subwoofer. Constructed in 12-millimeter birch plywood, the 206 has an integrated rear handle, and an optional mounting bracket. Power for the active Ventis models comes courtesy of a specially designed, Italian-made switching mode amplifier module. Low frequencies are driven by a 700-watt RMS (full bridge) Class D topology. For the HF stage, a 200-watt RMS performance is delivered via a meticulously crafted Class H / AB design. The Bottom Line: Located on the rear of each enclosure, a menu-driven system is navigated via a single rotary control with push-to-select functionality. A total of six pre-optimised settings are available, plus two further slots for users to form their own designs, using five parametric equalizers per slot. Also available is a high-pass filter, a mic/line selector, low, mid, and high tone settings and an optional delay of between 0 and 3.5 meters. Users can exclusively choose between two limiter modes, MAX-SPL or MAX-QUALITY, to best suit their performance.